This pattern for Jojoland Harmony superfine lace weight merino is easy and repetitive, and shows off the extremely gradual, subtle color changes to best effect. 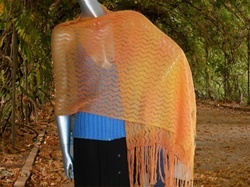 This yarn produces a fabric so light it is transluscent, and the colors simply glow from within. See the colors of Harmony here.